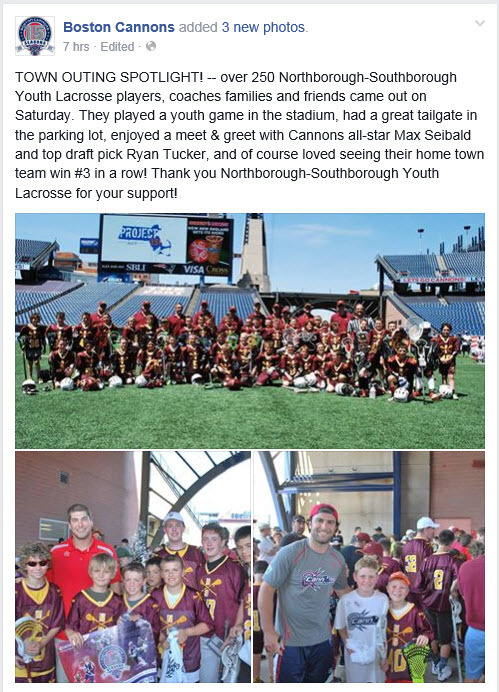 FOXBORO, MA (May 30, 2015) The Cannons welcomed the Launch to Gillette Stadium on Saturday night for the first meeting of the season between the two teams. Boston entered the contest with a 3-3 record, while Florida came into Foxborough with 1-5 mark on the year. Coming off of back-to-back wins, the Cannons were able to continue their winning ways, with a 13-9 victory to push their win streak to three in front of 10,143 fans. The Cannons started off the scoring just two and a half minutes into the game as Brent Adams was able to beat his defender and find the back of the net. Florida tied things up at one apiece six minutes later as Kiernan Mcardle scored a goal of his own coming off a cross field feed from Lyle Thompson. Just a minute and a half later, a Kevin Buchanan goal broke the deadlock to give the Cannons a 2-1 lead. In the final minutes of the first quarter, Davey Emala scored off an assist from Max Seibald to give Boston a 3-1 advantage through the first 15 minutes of play. Two quick goals from Mcardle sparked the Launch offense early in the second quarter, and briefly tied things up at three. However, the Cannons answered back with goals from Emala, Josh Amidon and Erik Smith to give Boston a 6-3 advantage after a half of play. The third quarter opened with a five minute scoring drought, before a goal from Will Manny extended the Cannons lead to four. Both teams showed strong defensive execution over the next eight minutes as both teams were held scoreless for the majority of the third quarter. However, the last minute of the third quarter showed a flurry of scoring from both teams. A strong team ride by the Cannons forced a Launch turnover, leading to a two-point goal by Buchanan. Florida responded with a goal of its own just 30 seconds later, coming off the stick of long-stick defenseman Casey Ikeda to cap a third quarter which saw the Cannons extend their lead to five. Florida started the fourth quarter scoring with a goal from Steven Brooks to cut the Cannons lead to four. However, Boston once again answered back just a minute later when Buchanan caught a pass from Seibald and ripped an outside shot past the Launch goaltender. Emala netted his third goal of the evening just minutes later after he was able to collect a rebound in front of the net, which extended the Cannons lead to 11-5. However, the Launch would not go down quietly. A behind the back feed by Casey Powell to Mcardle started a four point burst for the Launch which included a two-point goal from defenseman Bobby Lawrence and a goal from Lyle Thompson to tighten the game to 11-9. However, the Cannons defense held tough in the down the home-stretch. Amidon and Manny each recorded goals in the final minute to help secure the Cannons 13-9 victory. Davey Emala was named the Coca-Cola game MVP for his 3 goal and 1 assist performance. Kevin Buchanan (5 points) and Will Manny (3 goals, 1 assist) also helped fuel a strong offensive performance for the Cannons. Craig Bunker collected a team-high 9 groundballs, and won 10 of 20 face-offs for Boston. Adam Ghitelman backed the Cannons defense, and recorded 15 saves in net on the evening.